So I know I've been flakey about posting, but the good news is that after spending the last week staying up until 1am working on my half-manuscript, it is off in the mail to certain publishers and, well, lets just keep our fingers crossed shall we? So I've been decompressing over the last few days, which means being a couch potato (did you know that Monday nights they run 4 Star Trek: The Next Generation episodes back-to-back?) and also watching many movies, some good (the latest form Pixar, Up) and some that speak to the schmaltzy-over-sentimental-bad-film-indulgent part of me (I'm a bit embarrassed to mention this, but I've seen My Sister's Keeper and The Proposal in the last few days. I chalk it up to my brain needing a break). *Tenured Radical has a thoughtful post about the legacy of Michael Jackson (click here), much of it resonated with me, although I do wonder about the observation that Jackson's "whiteness" was more a function of transgender than transracial desire...it's provocative but I'm not sure I entirely agree, although the pictures of Jackson in the last ten years does make him look increasingly like a white woman...so TR has a point. *Anti-Racist Parent has a very interesting post about children and their questions about race (which can be awkward/embarrassing) and parents' reactions to those questions (click here), which the guest blogger, Jackie Morgan McDougall, handles in a remarkably candid fashion (it's a lengthy post--you need to read all the way to the end to see what I mean by her candor. I also respect her for taking responsibility for what she wrote and how she reacted and not just crawling into a fetal position when her post got so much (negative) attention. *Angry Asian Man has a post about Secretary of Energy Steven Chu and a Rolling Stone article about him and his efforts to save the planet (click here). You go Dr. Chu! *Finally, on a rather sad/depressing note, this article in The New York Times about the recent Supreme Court decision's ruling on race and employment/promotion practices--a decision guaranteed to *LITERALLY* change the face of the U.S. workplace (and not for the better, in my opinion). On Thursday, June 25, two pop culture icons of my youth passed away. Farrah Fawcett and Michael Jackson. This article on MSNBC's website, "Jackson and Fawcett deaths: Bad Day for Gen X" describes the cultural import of these two figures for people in their late 30s, like me, who grew up watching Charlie's Angels on t.v. and listening to Michael Jackson, first on the radio and eventually his music-movie videos on MTV. As for Michael Jackson, what can I say? I was loved "Off the Wall" and appreciated "Thriller." But I don't know that I would call myself a fan. Yet in watching VH1 replay his music videos I realized how much I had grown up with Jackson's music playing in the background--that if there is a soundtrack to my life, especially in the 1980s and early 1990s, his music would be threading its way throughout different moments of my adolescence--watching him perform the moonwalk dance live on TV, the premier of the "Thriller" music video directed by John Landis, the Captain EO ride at Disneyland (and for all of you who missed that, it was a unique experience! ), hearing all the bizarre rumors emerge about the Never Land Ranch--which was half-an-hour away from Santa Barbara, so our local media was first on the scene to cover all the strange reports coming out of there--and since I didn't leave Santa Barbara until 1995, there was A LOT to cover. In fact, when I would drive home from college to the Bay Area, I took a short cut through the Ojai Valley, and I could see the top of Jackson's ferris wheel from the road around Los Olivos (that's for all you SoCal/ex-UCSB folks!). I shudder to think what they would make of my Chinese Jamaican family. Or the resulting advertisement. I mean, you can all see it, right? People with Asian faces with dreadlocked hair speaking in Jamaican patois. UGH. Lets hope the ad people at Starburst are not reading this blog (really, what are the chances, right?). Moreover, isn't this commercial really questioning the ability to embrace two different ethnic cultures? So does that mean that all people of color, or maybe most particularly Asian Americans, are contradictions because we are BOTH Chinese AND American? And what do you do with the multiracial person who is black and Cuban and Vietnamese and American? That would just blow the minds of the Starburst execs. By the way, if you are all wondering why I'm not responding to comments (although I am posting them, really) and why I'm slow to write new posts, I have a deadline to some editors and I've been working until about 1-2am every night. When I told my father this, he tsk-tsked and was very sympathetic. But the truth is, I'm the one that set the deadline, and I am actually enjoying the work. It makes me a true academic geek I guess. But I also think that I feel lucky/blessed that I genuinely love what I do. It does mean that blogging is taking a back seat for now. But don't worry, I'll be back! Labels: Bizarre Korean-Scottish starburst commercial, why is it a contradiction to embrace two ethnicities? WTF??? "Oriental" complexity? I have NO IDEA what that means. And what does it have to do with the British class system? Seriously, I'm stumped on this one. It all sounds vaguely racist, but more to the point, it just sounds like a bunch of nonsense, meaning I can make NO SENSE out of this sentence. Labels: What the hell does oriental complexity mean and what does it have to do with the British class system? One thing about traveling: I end up doing a lot of reading, especially when I fly because immersing myself in a book is the one thing that will distract me from the discomfort of flying. 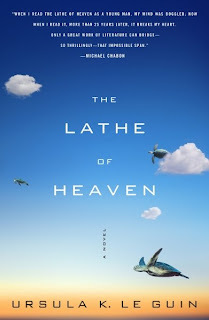 And one of the books that took up much of my concentration on my flight to New York City was Ursula Le Guin's The Lathe of Heaven. Le Guin is known as a science-fiction/fantasy writer. I first became acquainted with her work when I read A Wizard of Earthsea as a child (great story). There was a time when I devoured as much science fiction and fantasy as I could--great works like Susan Cooper's The Dark is Rising series, Lloyd Alexander's Chronicle of Prydain series, and Pier's Anthony's A Spell for Chameleon. Somewhere in the midst of these works I came across Le Guin. So it was nice to be re-introduced to her years later with her 1971 novel The Lathe of Heaven. I'm not sure where to begin in terms of the plot. The book itself is slim--around 184 pages. There are only three main characters, George Orr, an ordinary and non-descript man--the kind of person others easily dismiss, his doctor (a dream specialist) Dr. William Haber, a large man with a large ego/presence, and Heather LeLache, a lawyer with an iron will. The novel's premise, the action that propels the work, is that George Orr can change the world with this dreams. Discovering this strange ability when he was a teen, Orr comes to Dr. Haber because he does NOT want to dream--he does not want to be responsible with changing the world. And the world that Orr describes is an alternate earth that has been ravaged by ecological destruction and global violence. It is quite similar to our own world, except that the numbers of people who are experiencing poverty and hunger and the trauma of war is exponentially increased in the world that Le Guin has created. Which is one reason to read this book. It was written in 1971 and is eerily prescient in its description of the current environmental problems that plague us. In fact, I'd argue that the novel provides a glimpse of the future that we may, indeed, inhabit if global climate change continues unabated: overpopulation, lack of clear water and air, the fight for food and shelter, and the global devastation and warfare that will follow. Although initially dismissive of Orr's claim, Dr. Haber soon realizes that what George says is true: he can change the world with his dreams. What follows is a pretty dysfunctional/unethical doctor-patient relationship in which Haber, in the guise and with the intent of helping humanity, uses hypnosis to make suggestions to George of what to dream and hence how to change the world. Enter Heather LeLache, a lawyer that George Orr hires to try to stop Dr. Haber from controlling him and hence changing the world. And here's where the novel gets really interesting from the p.o.v. of this blog. Although it is not initially clear (Le Guin doesn't describe people by races, she describes their bodies) what we learn at the end of the chapter in which Heather is introduced is that she is bi-racial--her white father met and married her black mother during the Civil Rights era, where they were both ardent activists. And George, a white man with blond wispy hair, falls in love with Heather. That's all I'll say. There's much more. There are aliens. There are George's dreams. And there is an interesting solution to race in which everyone becomes grey. At any rate, telling you all of the above will not give anything away. Because there is so much to this small novel. There is so much philosophy and science and questions of ethics and environmental and ecological issues. Really, if you are in need of a good quick read, I'd recommend finding this novel at your local bookstore or library. You won't be disappointed, and hopefully you will find yourself drawn into the questions that the novel raises about how we can make our world better, because while we can't be like George Orr and dream our way into a better future, we certainly can work towards it in our waking lives. In the words of Rodney King, "Can't we all get along?" There's been a lot of things to blog about in the last 2-3 weeks I've been out of regular blogging-mode. And a lot of it I wish hadn't happened or didn't exist, because it's heartbreaking. The murder of Dr. George Tiller by an anti-choice zealot. The murder of security guard Stephen Tyrone Johns by an anti-semitic/racist zealot at the U.S. Holocaust Museum. The right-wing attacks on Supreme Court nominee Judge Sonia Sotomayor (and the bizarre portrait of her on the cover of The National Review with the title "The Wise Latina" combining racist caricatures of Asians with Latinas. Nice.). So let me leave you with this New York Times Op-Ed piece by Frank Rich, "The Obama Hater's Silent Enablers." And I know a lot of people have mocked Rodney King's infamous words uttered in the aftermath of his trial (and during the first hours of mayhem in Los Angeles) but really, can't we all get along? C'mon people--at minimum, can we just NOT shoot one another? *I am severely jet lagged right now. I really don't travel well. I never was one of those folks in college who backpacked throughout various continents (you know those folks who made their way by bus from Baja California to Argentina via Central America? That was NOT me. Or those other folks who did 20 countries in a summer through Europe? Not me). I don't travel well. I suffer from severe motion sickness. How severe? I had to take medication while traveling on the high speed ferry from Seattle to Victoria, BC--even though the water was like glass on the way out. And when friends of ours took us to see the new downtown Seattle library (which has a funky spiral design) I got dizzy just walking down from one stack to another. I got in yesterday and went straight to a series of meetings at Southern U. and this morning my body decided to say ENOUGH, and I am so tired I feel like every cell in my being is composed of lead. *I am having an allergic reaction to antibiotics. I currently have little red dots up and down my body. They haven't hit the palms of my hands or soles of my feet...yet. But they will. I am a sensitive soul--I have STRONG reactions to drugs of all kinds, and I have had this kind of drug reaction in the past to anti-biotics (and while I was traveling in Greece--you do NOT want to go to a Greek hospital on a small island in summer--that's another long story). Anyway, I am taking anti-biotics because . . .
*I need to have root canal surgery (which will be performed this afternoon). During my trip to NYC, I discovered a molar had become EXTRA SENSITIVE and luckily my dentist managed to squeeze me in during the 24 hour window I was home between trips. During which time, her x-rays confirmed an infection of my tooth, which was spreading to my jaw and causing me EXTREME PAIN. And if any of you has had tooth pain or jaw pain, you KNOW how bad it is--so bad that I woke up in the middle of the night because I could feel my tooth throbbing (YUCK). I was given pain meds and anti-biotics. Thankfully I'm no longer in pain, but of course I'm now covered in little red bumps (not very attractive). I know I'm over-sharing with all of you--but I also want to explain why I'm going to take a few days to get on my feet, blogging wise. I could, of course, have abbreviated all of the above. Which makes me wonder: have I turned into one of those bloggers who over-shares and uses my blog as a journal? Did I really need to go into detail about my various bodily ailments right now? Am I looking for sympathy, empathy, understanding, commiseration? Or am I just so painfully honest and thorough I figure I should tell the whole truth and nothing but the truth? Some things for me to explore while I'm recuperating. If any one has any thoughts on over-sharing in the blogosphere I'm all ears (or eyes). I know this isn't really on the topic of this blog--I promise you, I have things to say/write about race and America and mixed-race America given my various travels. But they'll probably have to wait until next week when I'm a bit more lucid. Until then, let me recommend that you check out the folks in my blogroll and/or you can read some previous posts of mine that are also listed on the sidebar. "How NOT to Write about Africa"
[Tip of the hat to the blogs Nobody Asked You and What Tami Said for the heads up"
Labels: "How not to write about Africa"
"Life will break you. Nobody can protect you from that, and living alone won't either, for solitude will also break you with its yearning. You have to love. You have to feel. It is the reason you are here on earth. You are here to risk your heart. You are here to be swallowed up. And when it happens that you are broken, or betrayed, or left, or hurt, or death brushes near, let yourself sit by an apple tree and listen to the apples falling all around you in heaps, wasting their sweetness. Tell yourself that you tatsed as many as you could." "Why do you want to know where I'm from?" Back when he was just Senator Obama . . .
"Barack Obama is our first (fill-in-the-blank)"
Labels: 2008, June 12, our obsession with categorizing people into distinct racial boxes, what IS Barack Obama? Why blog about race? Why the need or compulsion to write about race in a public internet forum? I'm not sure--perhaps this is a continuation of my experiment with the now defunct "Race to Survive" blog (a blog I began this past fall to talk about race in popular culture because the reality show Survivor had divided people into tribes by race). Perhaps I want to talk about race in popular culture and general American culture (like the upcoming presidential race). Or perhaps I want to blog in public because I'm embarking on a 15 month project of finishing my book manuscript on passing. At any rate, whether it's a conversation with random or known people in cyberspace or simply a way for me to get my thoughts on paper in a public way, I'm going to use this space to jot down my miscellaneous musings about race. And I invite you to join in the conversation. "How do I feel about "hapa"?" I've just returned from a trip to NYC and am turning around and heading out of town to yet ANOTHER conference (this one in Victoria, BC!). So while I'm gone, I will be checking email sporadically (as of this moment I still haven't decided whether I'm bringing my laptop--I probably will, but I'm curious to go a WHOLE WEEK without my laptop), which means that I probably won't be approving comments or writing posts until June 9. But never fear! I'm re-posting some Mixed Race America "classics" (I say that tongue-in-cheek) from June 2-8, posts that I think had an interesting comment thread or would be fun to look back on since I've now been blogging FOR OVER TWO YEARS!!! ALSO! I wanted to announce the winners of the APA Heritage Month Book Giveaway. Congratulations! I'll be submitting names/handles & email addresses to the Hachette Book Group, so for you prize-winners, if you didn't submit your email address to me already, could you please email me with your email address (you can find my email contact by clicking on "View My Complete Profile"). If I don't hear from all five winners by the time I return from the West Coast, I'll select replacement winners and send them on to the Hachette group. And thanks for everyone who left a comment during the month of May. I hope that for some of you who were first-time readers to this blog, that you'll consider coming back and leaving more comments. My favorite thing about blogging is the conversations I have on this blog and the relationships I've developed with other bloggers by following them to their own blogs. OK, I've got to go finish packing and cleaning and preparing for our dog sitter. Enjoy the MRM Classic posts this week!